Pujasera (culinary and shopping center) building located in Untung Jawa Island is demolished. It is feared could endanger local residents and visitors due to its damaged condition.
" 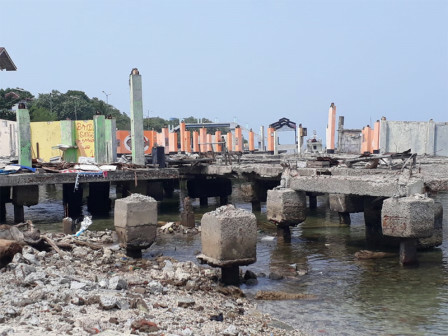 Until now, demolishing is still on progress and targeted to complete in August"
Untung Jawa Island Urban Village Head, Ade Slamet stated, demolishing is done in accordance to building warrant (SPMK) issued since May 15, 2018 by Jakarta Asset Management Agency. "Until now, demolishing is still on progress and targeted to complete in August," he informed, Thursday (7/19). He added, Jakarta Small Medium Enterprises Cooperative and Trade (KUKMP) Dept. plans to rebuild it into the first Seribu Islands Lenggang Jakarta in Untung Jawa Island. "We hope there will be many tourists to visit Untung Jawa Island because we will provide culinary and souvenir shopping center," he mentioned.